Relish the memory. : A Balinese Banquet. On my recent adventure to a foreign land I discovered that the term ‘Bali belly’ is alive and kicking. Most of us have heard a story about someone who traveled to the island of Indonesia and experienced a period of bed rest, vomiting and some long-winded dates with the toilet seat. It’s not always a part of the holiday plan. As a first time-traveler to Bali my main concern was to avoid consuming the filthy Balinese tap water. At first, this was a frustrating and dam right annoying adjustment. Buying bottled water is something I personally despise with a passion, but on this occasion it was deemed more than necessary. The neighbouring ‘Circle K’ mini supermarket softened the blow by selling 1.5L bottles for 3000 Rupiah, the equivalent of 43cents in New Zealand. Unfortunately for my travelling companion, he naively purchased a tasty smoothie from one of the many road-side restaurants. Needless to say the ice cubes in that drink were not mineral water and considering our “Grilled White Snapper” still tasted like frozen sea water, we made a well educated assumption and he prepared for the worst. That evening the worst surely came. For the rest of the trip we were extraordinarily careful about which restaurants we chose and we spent a fair chunk of holiday money on (cringe) bottled water. As the days passed I was intrigued by the stalls on the side of the road selling their local delights. I steered clear for the first week, secretly deciding that before I left I couldn’t come all this way without giving at least one street food feast a go. I would deal with the Bali belly later. So my tastebuds waited eagerly for their first traditional Balinese experience. 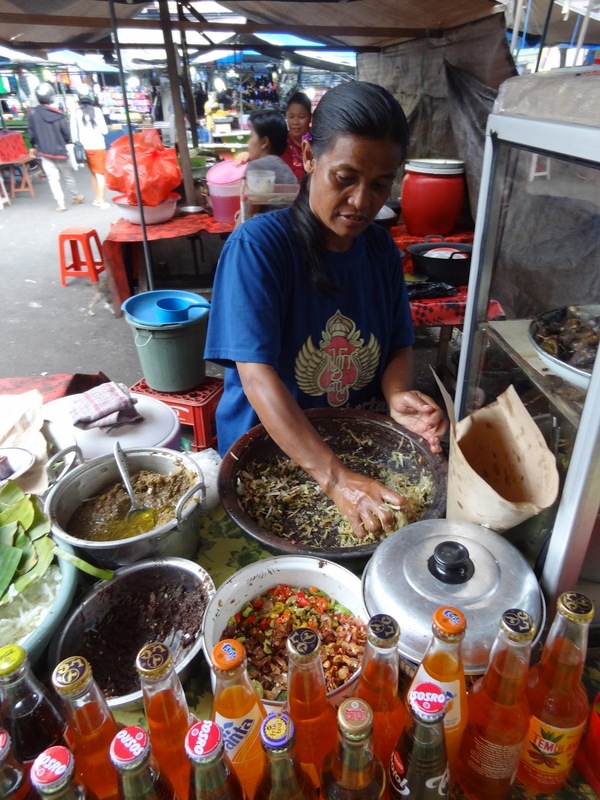 Our local Balinese friend Dede introduced me to the first of the ‘Bali Street Food’. For a guy who earns approximately NZ $3.50 a day, I trusted his judgement and figured I had nothing to lose. 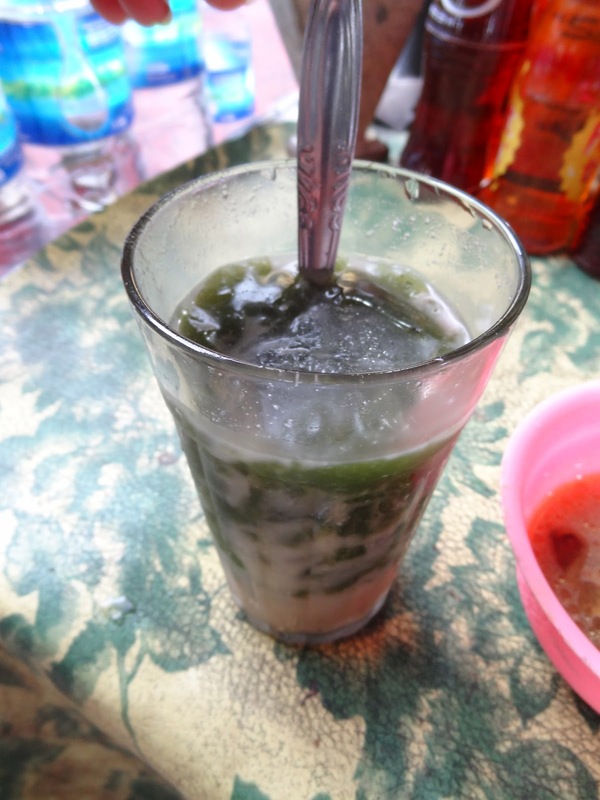 Everyone else was very skeptical, but as he led me to a typical dark hair and skinned Balinese women, who had worked all her life perfecting these delicacies; a surge of excitement ran through my veins. Naturally Dede ordered, one for me and one for himself. I would pay. 20,000 Rupiah for two satisfying meals. $2.85 NZD. It was the least I could do- the guy probably hadn’t eaten all day. As we watched her make it, I asked Dede to talk me through each ingredient she added to the meal. ‘Lawar’ is a traditional balinese side-dish served during celebrations and was a highlight among our culinary adventures. It consisted of coconut, jackfruit, roasted chilli and garlic, a salted prawn paste and some other extraordinary and colourful looking concoction. She was mixing it with her hands, but funnily enough that didn’t phase me. A big scoop of perfectly cooked fluffy white rice filled the bottom of the red plastic plate, then she added the lawar. I could feel my mouth salivating. A pork mince kebab stick and another kebab of pork chunks were served atop my meals, along with some chewy crispy pork bone off cuts. The dish was accompanied by a bright yellow turmeric flavoured clear broth served in a small light pink plastic bowl-with exactly three pieces of leftover pork flaps-providing minimal meat, but maximal flavour. When I finally tucked in my friends looked at me in horror…Clearly I would not be entitled to an ounce of sympathy tomorrow. I was skeptical for a second or two, but once I started eating, I knew the Bali belly would be well worth it. Needless to say I devoured the lot. The flavours were amazing, so intense and different to anything I have every had before. Pork is the signature meat in Bali, and they certainly know how to make it a winner. If given a blind taste-test with this stuff I highly doubt many could turn it down. It really was that good. Dede ordered me a drink with no name, to wash the feast down. He described it as natural, healthy and really good for you. It consisted of a dark green jelly like substance emerged in a murky whitish liquid. Nothing appetizing about its appearance. But the taste, continued to blow my mind. A slightly sweet and tangy ‘juice’ accompanied by the refreshing jube like bits. Yum. It went down a treat. I wanted more. But knew I should wait and see how my body reacted to these new found flavours. But that moment sitting at the local markets soaking up the atmosphere was one I will never forget. Life there was far from flash, but dam it tasted good. Well Bali. Bye for now. I'll be back. P.S. No sign of Bali belly. Thank goodness.